ProPredictions sports betting guide, expert tipsters give free betting advice including tips and predictions for top European football (soccer) leagues. We all know and use major social networks like Facebook, Twitter or Instagram, that are great for networking, messaging, sharing photos or commenting posts. Yet, when it comes to specific domain like sports betting and gambling, major social networks are not the best option. Facebook and Twitter don't like gambling or betting content, they are blocking gambling advertising, deleting pages or groups without your consent, for as they say "breach of terms and conditions". And this is where new, decentralized, Blockchain powered media like Scorum comes in. Scorum is a new generation media network with sports and related services like sports betting as the main topic. 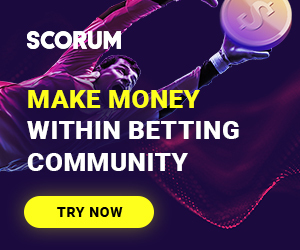 Scorum is not only a social network, but also a blogging platform and commission free betting exchange supported by sports fans from all over the world. One of the biggest advantages over today's major social networks is that Scorum is sports optimized platform that rewards active users. At Scorum, you get paid in cryptocurrency for publishing posts, voting, commenting and uploading photos, so basically for everything you do on a daily basics on Facebook or Twitter. On Facebook you post content and they collect the money, on Scorum the money goes in your pockets as well. We believe this is new, revolutionary way and you should definitely check out all that Scorum can offer. 1. The highest number of goals scored by a single footballer during one match is 16. We have two footballers with that title; the first man who did it was Stephan Stanis, who did it in 1942. And the second man did it in 2007 and his name is Panagiotis Pontikos. 2. The fastest goal ever scored was only 2.8 seconds after the beginning of the match. The football player from Uruguay called Ricardo Olivera managed to score this amazing goal in 1998. 3. The shortest professional football player is Élton José Xavier Gomes. He is 1,54 meters tall and he is actually a pretty good football player. At the moment he is playing at the attacking midfielder position for Saudi club Al-Fateh. 4. The tallest football player, on the other hand, is Kristof van Hout. He is a goalkeeper and he is currently playing for India’s Delhi Dynamos. The tallest football player is 2.08 meters high. 6. Gareth Bale has one of the most impressive titles in the football world. He is known as the fastest football player with speed of incredible 36,9 km/h. That fast jewel is currently playing for Real Madrid. 7. Who wouldn’t want to have a goalkeeper who can score? Rogerio Ceni is definitely an interesting goalkeeper because he managed to score 128 goals in his entire career as a goalkeeper. 8. I am sure you all know that Lionel Messi holds the record for the highest number of goals in 365 days with 91 goals, but did you know that Pele is unofficial recorder with 127 scored goals. 9. The weirdest football match ever was held in Argentina in 2010. In that match, referee managed to issue 36 red cards, meaning that he expelled the entire team with coaches from the game. Video. 10. The first black professional foosball and the first to play the Football League player was Arthur Wharton, who was born in Ghana and spent most of his life in England. This post was written by Mark from Foosball Zone, as a guest writer. Mark is a fierce football fan and former foosball player who has a blog about foosball. The blog is filled with useful information about foosball history, rules and regulations, top foosball tables and tutorials. With so many online bookmakers around the World, each one is trying hard to attract as many punters as possible. One of the ways of incentivising punters to sign up is by offering them free bets, and these bets are often for football, as it's one of the biggest markets online. Although free bets are indeed free, it certainly won’t do to simply squander them on the basis that the bet has no consequences. Anyone who uses free bets wisely will know that they are the perfect way to get a solid, tangible advantage. Let’s take a look at how to make the best of the free football bets offered by online bookmakers. First, make certain that you understand the terms and conditions of a free bet, before you accept it. Even the best soccer betting sites are not in the habit of simply giving away free money; so free bets will always have terms and conditions attached. Read those terms and conditions carefully, and make sure that you understand them. In some cases, free football bets will only be applicable to specific games, matches or tournaments, or can only be used in specific circumstances. Again, make sure that you understand these conditions, and are using the free bet in the way in which it was intended. Placing a free bet incorrectly will often result in it being nullified, which is a waste of a potentially good advantage. Instead of simply throwing down a free bet and hoping for the best, think about how to use it carefully. Applying it to a long shot bet may be a bit of fun, but often not the smartest move. Instead, try and place the free bet on a relatively safe option, if the rules of the free bet allow you to do so. Then, take the winnings and place them on another relatively safe bet. This can compound the cash and result in a tidy sum going straight into your pocket. Note however that you may not be able to withdraw the winnings until certain terms and conditions are met. There are many sports sites that explain how to make the most of free football bets and how to use betting tips to your advantage. It is certainly recommended that you visit these sites, and pay very close attention to the advice given. By being slow and methodical and following the expert advice of tipsters and football pros, a person can amass a good amount of cash, using nothing but free football bets. It is not, however, a quick and easy process, as each bet made must be placed with careful consideration. A patient, smart soccer punter will, with time, be able to keep their bankroll gradually growing, risking none of their own money. If you are not the type of person who has this much time and patience, however, be sure to at least make the most of your free bets, without tossing them to the wind and wasting them! Free soccer bets are a great way to kick start your betting and can set you on the road to big wins and even bigger rewards. This post was written by Australian Soccer Betting Sites, as a guest writer. 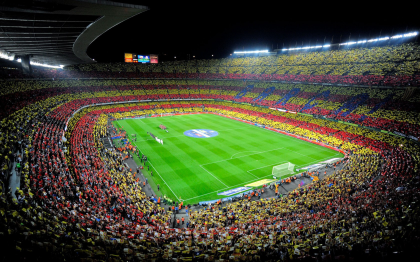 Football markets are the biggest and busiest of all sports markets, and offer a variety of bets. Understanding the betting options available is one of the secrets of successful punting. A knowledge of the different types of football bets, especially the most popular among them, is essential if punters want to go beyond placing straight win bets. It should be borne in mind that many of the bets other than win bets are seldom easy wins, so understanding odds and keeping up with news of the sport is an important part of betting on the beautiful game. Money line, proposition or prop, parlay, over/under, and point spread are the most popular of the different football bets offered by best football sportsbooks. Other types of bets are also offered; however, these make a good introduction to the market. Betting on either team playing a football game, or betting on the teams to draw, is placing a money line bet. Sportsbooks’ money lines usually offer odds on each of those potential outcomes. Don’t expect great odds if two strong teams who are massive rivals are to face one another. However, if one of those teams is a definite underdog, the odds can be surprising, and if they win, the payout could be significant. Different sportsbooks have different rules for money line bets, so be sure to check what the rules are before placing any bets. Usually sportsbooks’ money lines apply to the standard 90 minutes of play, although they can cover injury time as well. Proposition bets are very specific bets placed on football players or on statistics in a game. While an array of prop bets is usually offered, the most popular of them are betting on correct scores and betting on the first player to score a goal. Other prop bets may include betting on the number of corner kicks made by a team, which team will score the first goal, and how many times the yellow card will be shown. Correct scores bets are known for competitive odds, and can turn out to be among the markets’ highest-paying bets. Parlay or accumulator bets require two or more teams to be selected to win matches, usually in a tournament. Every team selected needs to win for the accumulator bet to be a winning bet. One of the biggest differences between parlay bets and placing a money line bet on each of those teams is the odds. 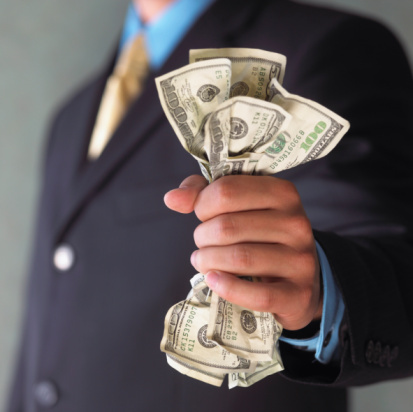 If a parlay bet wins, the payout is usually bigger than individual money line bets offer. Betting on whether the total number of goals to be scored in a football match will be higher or lower than the number predicted by a sportsbook is placing an over/under bet. For example, in a match between Manchester United and Chelsea, a sportsbook may predict that 2.5 goals will be scored. You could bet on whether the actual number of goals scored will be over 2.5, i.e. 3 or more goals, or under 2.5, i.e. 2 or fewer. Point spread bets are similar to money line bets, in that you would need to bet on a team to win a match. However, that is where the similarity ends. A sportsbook sets a number known as the point spread for each match. In most games, the underdog is at +0.5, which gives them a slight lead over the favourite, which is usually at -0.5. If you bet on the underdog to win, but the match ends in a draw, your bet will still win. You can read more about point spread betting in our Asian handicap guide. This post was written by Online Betting NZ, as a guest writer on Expert Football Predictions. So what distinguishes winning from losing tipsters? Best way to distinguish good from poor tipsters is to look at the odds a player received when they made their bet and compare it with the market’s closing line. Consistently beating the closing odds at the sharpest online bookmakers such as; PinnacleSports, SBOBet or Matchbook can be a strong indicator of long-term betting profits. Beating the closing line doesn’t itself guarantee an individual bet will be profitable, but given that Pinnacle is one of the sharpest, consistently beating their closing line in the long run is the best indicator of winning tipster. Why closing lines are so important? When a bookmaker opens a market for an upcoming game, the opening odds are calculated based on statistical analysis of the team’s past performances, factoring in any other relevant piece of information such as injuries, betting trends and public sentiments. Once the odds become available, the players bet on the markets they consider good value, causing the bookmakers to constantly adjust the odds in order to maintain a balanced book and avoid exposure on one side. The odds offered just before a game begins are called the closing line and reflect all statistics, news, wagering activities and market sentiment. The closing line should be the most efficient point of the market, and according to the efficient market hypothesis the closing odds are on average more accurate than the opening odds in predicting the probability of how a fixture will play out. How to avoid bad and find good tipsters? Finding a good tipsters to follow can be hard, the most obvious point would be that they make a profit, but there are more tips to help. The first point for good tipster is to have their results verified by a independent third party service (such as blogabet), with accurate and easy to understand record of their full past performance. It might sound obvious, but you simply can’t just take a tipsters claims of profit. The best tipsters are often the longest-running, as they have proved themselves through good and bad times. 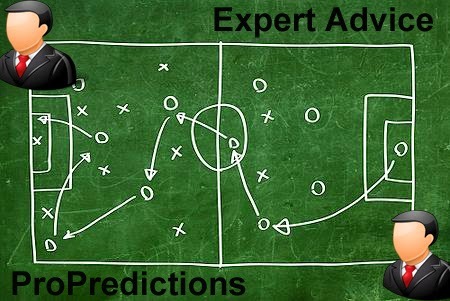 ProPredictions tipsters have been around for couple of years so you can be confident of finding wise betting decisions. Finally, be careful with tipster that constantly changes its approach to tipping, especially after a bad run. When this happens it often screams out that he don’t really know where his head is. At ProPredictions our tipsters are betting only on top European football leagues and 99% of our tips are either Asian handicap or Under/Over bets. And now we’ll give you advice how to avoid bad tipsters. Avoid social media such as facebook or twitter tipsters that claim of making tens of thousands of euros/dollars a month (often with picture proof). It’s all too easy to set up a new facebook page or twitter account, put up a bunch of tips and if they win, great, if they lose, just delete and open a new account. Avoid tipsters that claim to have "inside information" about tips guaranteed to win (sure or fixed tips). It’s the oldest trick in the book but the sad reality is that even if there is an element of people who do get inside info, they are never going to share it with a stranger, no matter how convincing they sound or how much they charge. And the last dubious practice we will share are the tipsters who continuously quote odds with bookies that no one will realistically match. There are many minor bookmakers that appear to offer attractive odds, but try to get more than €10 on at those odds and you will be disappointing. ProPredictions premium tips are proofed from a selection of best football bookmakers that we know players can trust. Parts of the text from: pinnacle articles, football-data.co.uk articles and betadvisor blog. -If you do not have betting experience or time to watch tons of live football, read and follow all betting news on daily basics, bet with our football betting predictions. -If you are tired of losing money on your sports betting, bet only on premium tips. -If you want to win money, do not bet just for the sake of it, bet to win. Place your bets only on things you see as great opportunity. -Always keep in mind that oddsmaker and bookies are not easy to beat. They work 24/7, do you!? -Whatever tipsters like to claim, the truth is nobody can guarantee winnings and profit in sports betting. -In regards to above statement, it is wise to gamble with money that you can afford to lose, in that way all you win is great bonus money. -Sports betting is more like a marathon, not a sprint. It takes hard work, preparation, patience and discipline. -Set yourself limits in both money and time and keep track. -Never bet more than 5% of your bankroll. For example, if we place bet with 6/10 units (10 representing 5%), it means you should bet with 3% of your bankroll. Bet management is discipline that you must master to win money in sports betting. -Live betting is great way to bet on value or reduce damage if things do not go the way you expect (e.g. early red card or injury to key player). -Increase your probability for winning and bet on singles and Asian handicap market. If you are new to AH betting, read our Asian handicap betting guide. Bitcoin betting is great solution if you want to bet anonymously, have a problem with government restrictions, ISP blocking or taxes. There is no identity checks, Bitcoin bookmakers accounts can be opened with emails, or even without them, and a bitcoin transactions is almost impossible to trace. If you are new to Bitcoin, it is good place to start by reading this bitcoin betting guide. So what is Bitcoin? Bitcoin is an innovative payment network and a new kind of money, digital money. Bitcoin was created as a protocol based on mathematical algorithms and cryptography, so the media often refer to it as a cryptocurrency or digital currency. 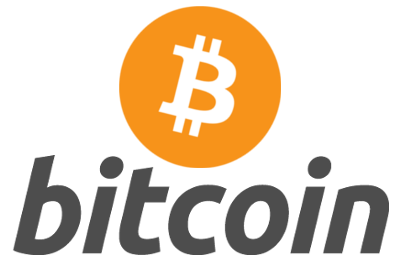 Bitcoin uses peer-to-peer technology to operate without a bank or any type of central authority. Transactions and the issuing of bitcoins is carried out collectively by the network. Bitcoin is open source, with its design completely public therefore nobody controls or owns bitcoin yet everyone can take part. Because of its unique properties, bitcoin allows fast transactions, instant deposits/withdrawals, and other exciting uses that could not be covered by any previous payment system. One of the key advantages of Bitcoin is that you can keep them anonymously, like cash, so you can also gamble anonymously. Although all the transactions are kept in transparent and public ledgers like blockchain, no personal identifying information is tied to any Bitcoin addresses. How and where to buy Bitcoins for your anonymous bitcoin betting? There are various methods to buy and sell Bitcoins. The easiest and fastest anonymous way is to buy them on a bitcoin ATM. You can use this map to find your nearest bitcoin ATM. Bitcoins can also be bought anonymously from individual local traders that own bitcoin as well as sell them to anyone interested in buying them. Traders can be found on localbitcoins. You can also buy bitcoins online with some of the popular online payment methods like; Skrill/Moneybookers, Neteller, PayPal, Ukash, WebMoney, Moneygram.. Other ways to buy and sell bitcoins are through bitcoin exchanges that can be found here; how to buy bitcoins in your country. For most people, gambling is a fun, enjoyable recreational activity which they are able to enjoy without losing control. Whilst the majority of people do gamble within their means, for some, gambling can become a serious problem. When you have a gambling problem, it's not just your problem. It's a problem for your family, your employer, your health and your future. It's an emotional problem with real financial consequences. - Do you gamble to escape worry, boredom, loneliness or in any way unhappy life? - Did you ever gamble to get money to pay debts or otherwise solve financial difficulties? - Did you ever borrow or sold anything to finance your gambling? - Have you lost interest in your family, friends or hobbies because of your gambling? - Has your gambling caused you any health problems, including stress or anxiety? The more you answer ‘yes’ to these questions, the more likely you are to have a serious gambling problem. If you need to talk to someone who can give you advice and support, we suggest: GameCare or GamblersAnonymous. - Don’t think of gambling as a way to make money or to escape problems. - Always gamble with money that you can afford to lose, if you win then it is a bonus. - Have realistic expectations, don't gamble to win money to pay bills. - Set yourself limits in both money and time. - Keep track of the time and monitor the amount of money you spend. - Don’t gamble when you are depressed or upset. - Balance gambling with other activities. - Gambling and alcohol are not a good combination. - Try to understand the odds/probabilities of winning and losing, and the rules of the games you are playing. You can also read useful betting advice in our expert betting advice. Originating from Asia, Asian Handicap is a method of betting that reduces the possible number of outcomes from three (in traditional 1X2 betting) to two by eliminating the draw (X) outcome. This simplification delivers two betting options that each have a near 50% chance of success. Because of this increased probability for winning, Asian handicap has gained considerable popularity. Bookmakers always offer higher odds on Asian handicap, routinely paying out at rates between 97-99%, as compared to traditional 1X2 betting where the payout ranges between 89-94%. There are three basic types of Asian Handicaps: Level Handicap, Single Handicap and Double or Split Handicap. Where there is no seen difference in abilities between TeamA and TeamB, no handicap line is assigned, and both start off "0" also known as pk, pick’em or scratch. Here you are really betting without the draw being an option. You win if your selected team wins. If it is a draw, your stake is returned. Where there is a seen difference in abilities between TeamA and TeamB, the favorite team will be given an appropriate handicap to level the playing field for betting purposes i.e. -0.5 goal, -1 goal, -1.5 goals etc. For example, if you bet on TeamA with a handicap of -1 goal, they must win by more than one goal to cover their handicap and for you to win your bet. If they only win by a goal, the result with the handicap applied is a draw for betting purposes, so your bet is refunded. If TeamB draw or win, you will lose your bet on Team A. Where the difference in two teams’ abilities is slight, split ball Asian Handicaps may be used splitting the stake into two separate bets. For example TeamA might be offered as AH-0,25 (0,-0,5). 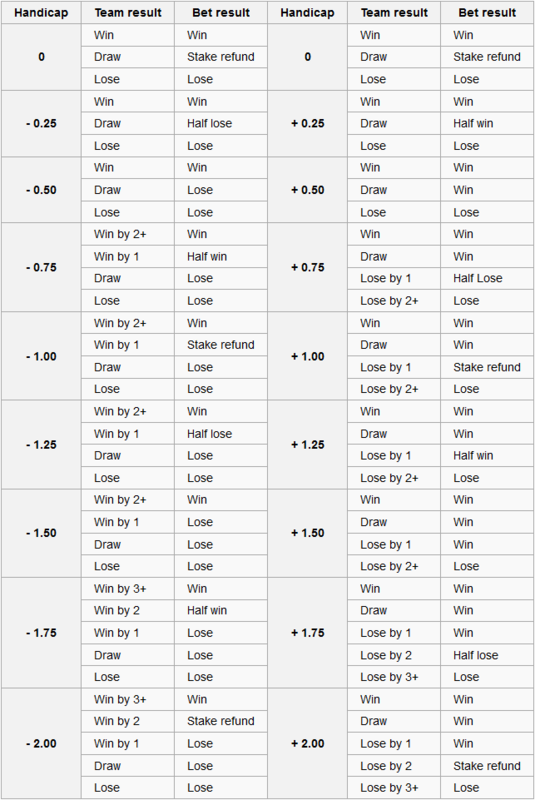 If you bet on TeamA and they lose, you will lose both bets as they did not cover either handicap. If the match ends in a draw, half of your stake at "0" will be refunded, and the other half at -0.5 will lose. If TeamA wins, both handicaps will be covered so both bets win. If Chelsea win by at least 2 goals (i.e. 2:0, 3:0), they win this market after the handicap is applied. If Chelsea win by 1 goal (i.e. 1:0, 2:1), the market is a draw after the handicap is applied. All stakes are returned. If Chelsea draw or lose, Everton win this market after the handicap is applied. The bet is divided between a team's two handicaps. Therefore your bet is actually two bets, e.g. a 100€ bet is two 50€ bets on each handicap. If Chelsea win by at least 2 goals, they win both handicap markets after the handicap is applied. If Chelsea win by 1 goal, they lose the -1.5 market and draw the -1 market (half the total stakes would be returned). If Chelsea draw or lose, Everton wins both handicaps after the handicap is applied. If Chelsea win by at least 2 goals, they win this market after the handicap is applied. If Chelsea win by 1 goal or they draw or lose, Everton win this market after the handicap is applied.